Protect your complexion from the elements and daily damage-causing aggressors with the Elizabeth Arden Prevage 4 Piece Daily Serum Set; a set of four super-protective and caring skincare solutions that work in synergy to ward of premature ageing caused by sun damage and pollutants. Housed in a sleek gift box, the set comes with three metallic cosmetic pouches for convenient on-the-go storage. A hydrating elixir that works to strengthen skin's natural defences whilst boosting radiance. Caring for the surface of your skin is important; the health and condition of your skin's surface layer has a direct correlation to how radiant and youthful your skin looks. With this in mind, the SuperStart Skin Renewal Booster expertly targets the skin's surface, supporting healthy skin cells and strengthening the natural moisture barrier to ensure skin is left resilient and hydrated. Boosting natural defences and the effectiveness of your skincare regimen, the formula will fortify the skin's ability to repair and renew itself, so you can feel confident your skin looks and feels protected, radiant and younger-looking. A high-performance serum that transforms the look of skin with Idebenone (the most powerful antioxidant available) and environmental defenders. Absorbing rapidly into skin with its lightweight texture, the formula shields skin from external assaults and intercepts further harm that cause skin to age. Plumping skin with its hydrating powers and time-release technology, it helps to diminish the appearance of wrinkles and fine lines, whilst improving the look of firmness. A high performance multi-defense moisturiser enriched with Idebenone (the most powerful antioxidant available on the market) that helps even skin tone and diminish the appearance of aging signs including fine lines and wrinkles. Locking in long-lasting moisture to enhance the benefits of the serum, it keeps skin hydrated, supple and bouncy throughout the day. A sheer, oil-free, multi-active skin defender that not only protects against environmental stressors but also helps to repair the appearance of past damage to keep skin looking younger and brighter. An Anti-Pollution Complex and broad-spectrum SPF 50 physical filters form an invisible protective veil over skin to screen out pollutants and harmful UVA/UVB rays. Powerful antioxidants fight free radicals while a DNA Enzyme Complex™ supports skin’s natural repair system. Essential daily care to keep skin looking youthful, healthy and radiant. Booster: Use as the first step in your skincare regime. Serum: Apply 1-2 pumps to fingertips. Smooth onto cleansed face and throat. Day Cream: Apply daily to your cleansed skin before sun exposure and after using your Prevage serum. 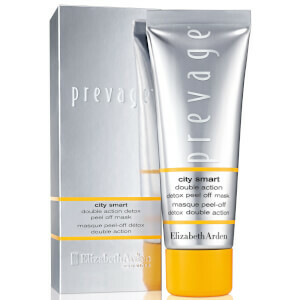 City Smart: Apply evenly to face and neck as the last step in your morning skincare regime regardless of age, skin type, or concern. Booster: Water/Aqua/Eau, Glycerin, Pentylene Glycol, Butylene Glycol, Caprylic/Capric Triglyceride, Cyclopentasiloxane, Dimethicone, Peg-11 Methyl Ether Dimethicone, Alpha-Glucan Oligosaccharide, Ammonium Acryloyldimethyltaurate/Vp Copolymer, Amodimethicone, Caprylyl Glycol, Carbomer, Ceramide 1, Ceramide 3, Ceramide 6 Ii, Cholesterol, Crithmum Maritimum Extract, Dimethicone/Vinyl Dimethicone Crosspolymer, Disodium Edta, Ethylhexylglycerin, Kefiran, Lactobacillus, Linum Usitatissimum (Linseed) Seed Extract, Maltodextrin, Parfum/Fragrance, Phytosphingosine, Polymnia Sonchifolia Root Juice, Saccharide Isomerate, Salicornia Herbacea Extract, Sodium Hydroxide, Sodium Lauroyl Lactylate, Sodium Polyacrylate Starch, Xanthan Gum, Chlorphenesin, Phenoxyethanol, Sodium Benzoate. Serum: Water/Aqua/Eau, Peg-8, Dimethicone, Cyclopentasiloxane, Butylene Glycol, C12-15 Alkyl Benzoate, Glycerin, Dimethicone Crosspolymer, Propylene Glycol, Ammonium Acryloyldimethyltaurate/Vp Copolymer, Ammonium Acryloyldimethyltaurate/Beheneth-25 Methacrylate Crosspolymer, Camellia Sinensis Leaf Extract, Caprylyl Glycol, Caprylyl/Capryl Glucoside, Cyclohexasiloxane, Dimethicone/Vinyl Dimethicone Crosspolymer, Ergothioneine, Hexylene Glycol, Hydrogenated Lecithin, Hydrogenated Phosphatidylcholine, Hydroxydecyl Ubiquinoyl Dipalmitoyl Glycerate, Lactobacillus/Arundinaria Gigantea Leaf Ferment Filtrate, Mica, Parfum/Fragrance, Peg-40 Hydrogenated Castor Oil, Peucedanum Graveolens (Dill) Extract, Polyisobutene, Polyphosphorylcholine Glycol Acrylate, Polyquaternium-51, Sodium Acrylate/Acryloyldimethyl Taurate Copolymer, Sodium Hyaluronate, Sodium Pca, Tetrasodium Edta, Trehalose, Urea, Xanthan Gum, Dimethylmethoxy Chromanol, Hydroxycitronellal, Benzoic Acid, Chlorphenesin, Methylparaben, Phenoxyethanol, Sorbic Acid, Red 4 (Ci 14700), Titanium Dioxide (Ci 77891), Yellow 5 (Ci 19140). Day Cream: Water/Aqua/Eau, Ethylhexyl Methoxycinnamate, Dimethicone, Benzophenone-3, Ethylhexyl Salicylate, Butylene Glycol, C12-15 Alkyl Benzoate, Octocrylene, Butyl Methoxydibenzoylmethane, Isostearyl Neopentanoate, Butyrospermum Parkii (Shea) Butter, Theobroma Cacao (Cocoa) Seed Butter, Cyclopentasiloxane, Propylene Glycol, Ppg-2 Isoceteth-20 Acetate, Glycerin, Caprylic/Capric Triglyceride, Acrylamide/Sodium Acrylate Copolymer, Acrylates/C10-30 Alkyl Acrylate Crosspolymer, Caprylyl Glycol, Carbomer, Cetearyl Alcohol, Cetearyl Dimethicone Crosspolymer, Cyclohexasiloxane, Dimethicone Crosspolymer, Dimethiconol, Ergothioneine, Hexylene Glycol, Hibiscus Abelmoschus Seed Extract, Hydrogenated Lecithin, Hydrogenated Phosphatidylcholine, Hydroxydecyl Ubiquinoyl Dipalmitoyl Glycerate, Hydroxyethyl Acrylate/Sodium Acryloyldimethyl Taurate Copolymer, Isohexadecane, Mica, Mineral Oil/Paraffinum Liquidum/Huile Minerale, Parfum/Fragrance, Peg-8, Phenyl Trimethicone, Phospholipids, Polyphosphorylcholine Glycol Acrylate, Polyquaternium-51, Polysorbate 60, Retinyl Linoleate, Sodium Hyaluronate, Sodium Hydroxide, Sodium Pca, Sucrose, Trehalose, Trideceth-6, Urea, Xanthan Gum, Bht, Alpha-Isomethyl Ionone, Linalool, Benzoic Acid, Chlorphenesin, Methylparaben, Phenoxyethanol, Propylparaben, Iron Oxides (Ci 77492), Red 4 (Ci 14700), Titanium Dioxide (Ci 77891), Yellow 5 (Ci 19140). City Smart: Cyclopentasiloxane, Water/Aqua/Eau, Isododecane, Dimethicone, Titanium Dioxide, Zinc Oxide, C12-15 Alkyl Benzoate, Isopropyl Myristate, Pentylene Glycol, Butylene Glycol, Silica Dimethyl Silylate, Caprylyl Methicone, Polyglyceryl-3 Polydimethylsiloxyethyl Dimethicone, Acrylates/Polytrimethylsiloxymethacrylate Copolymer, Glycerin, Aluminum Hydroxide, Stearic Acid, Peg-9 Polydimethylsiloxyethyl Dimethicone, Carnosine, Acrylates/Ethylhexyl Acrylate/Dimethicone Methacrylate Copolymer, Arabidopsis Thaliana Extract, Camellia Sinensis Leaf Extract, Caprylyl Glycol, Disodium Edta, Ergothioneine, Ferulic Acid, Hydrogen Dimethicone, Hydroxydecyl Ubiquinoyl Dipalmitoyl Glycerate, Lecithin, Mica, Micrococcus Lysate, Parfum/Fragrance, Peg/Ppg-18/18 Dimethicone, Plankton Extract, Sodium Pca, Tin Oxide, Tocopheryl Acetate, Triethoxycaprylylsilane, Alpha-Isomethyl Ionone, Linalool, Chlorphenesin, Phenoxyethanol, Iron Oxides (Ci 77491, Ci 77492, Ci 77499), Titanium Dioxide (Ci 77891).